I have no air! (In my Copic air can I mean....). My can ran out of juice a couple months ago and I have not had a chance to get another - so no air brushing for me. 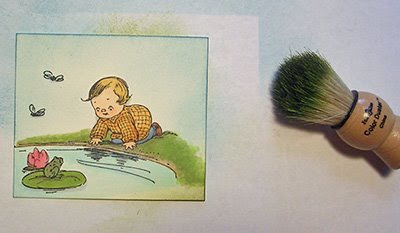 I thought I'd share how I have been making "sky" and "grass" since I became "breathless". Of course this would work with any colored image, not just Copics. 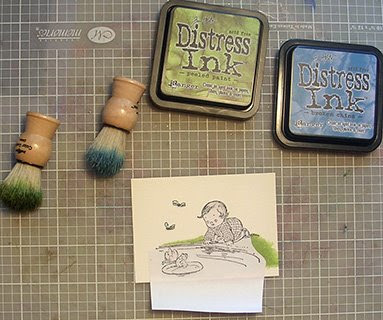 First stamp and color your image. 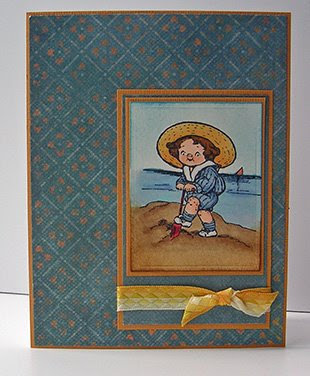 Here I used the one of the little boys from the exclusive Little Boy Blue Stamp kit from Paper Garden Projects. While your stamp is inky, go ahead and stamp a mask for the image. I love Eclipse Paper for this. It has post-it note like sticky across the whole back and the paper is thin but pretty tough, so it can be reused. I store my masks in the CD case with my stamps so I don't have to cut it out again when I need it. Mask your image and apply ink to the sky area with a duster brush. My favorite inks for this are the Ranger Distress inks because they stay wet a little longer and go on very evenly - but any dye based ink will do. My mask does not cover all the "grass" in my picture. I'm not too concerned if a little blue mixes with the edge of my grass - but I really do not want any blue on my little boy's face! So I made sure my mask completely covered the little boy. I didn't worry about covering the bugs. Just ink the duster brush by tapping it on the pad. 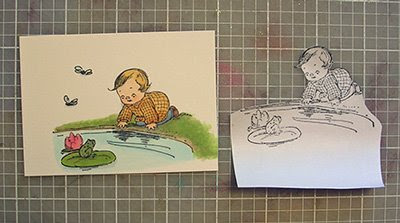 Tap off the extra ink on scrap paper, then sweep the brush from the scrap paper, across the edge of the image, and towards the center. Keep sweeping till you get the darkness you want, turning the paper as you go around. Here I added a little green to the bottom edges. And here is the finished card. The cute little duck is part of the kit too. He is cut out with a Nestibility die and popped up on foam tape. I inked the edge of the circle with the duster brush as well. 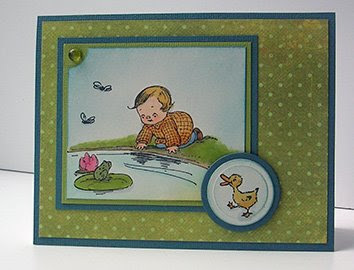 Here is another card using a different image from the Little Boy Blue Stamp kit. The sky was done in the same way here and Vintage Photo distress ink was added to the "sand" at the bottom. This technique won't give you the exact same result as the airbrush. The color is not quite as even and there is intense color at the edge of the cardstock. But I think it works quite nicely. And the duster brushes can be used for other effects. You can use the Eclipse paper to create a mask and then ink around it with the brushes. Or use a decorative punch with the Eclipse paper to create a stencil - you can then ink inside the punched area. 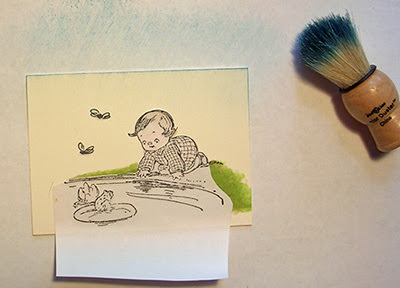 The duster brushes can also be lightly brushed over paper to enhance the texture - it works great with Cuttlebug embossing. So that is my take on Duster Brushes, one of my favorite tools. Thanks so much for stopping by! I LOVE THESE KIDS, of course they make me want to go get a bowl of soup. You did a great job on the coloring, even without air. Thanks for sharing. Wowzers, you really are good with copics. Your class was well worth it. Don't those characters remind you of the Campbell soup kids--LOL. I had to read where they were from because they look just like them. Well, Cathy, I finally, finally got around to doing your challenge, and guess what? Got my card uploaded, but then my computer (I have three) crashed. Hubby's looking at it now. If I don't get it back up, I'll have to try and upload to my laptop before tomorrow. These are fabulous! Where do you get those duster thingies? These are fabulous! Where do you get those dusters??! I love the Duster brushes too. Those stamps are adorable and you colored them beautifully. Great cards. OMG I totally forgot I had some Eclipse tape! I've been struggling with post-its. Ack! Thanks for the reminder. Great tutorial, Cathy! And, love the images!